One of the discontents of art historical connoisseurship is how we, the practitioners, have been trained to hunt for the prototype of any given invention. We are so used to seeing precedents everywhere, even when dealing with some of the most original and inventive artists ever, that we sometimes forget how unpredictable art, and creativity, can be. If an earlier likeness of a given detail in a work of art can be identified, it seems the latter has to derive from it. This sometimes results in daring feats of historical contortionism on the part of scholars trying to establish how the artist can have seen and copied, or at least internalised, the prototype. As if coincidence is impossible and he could not have come up with it himself. This problem is a constant when working on Titian, who clearly had an almost sponge-like approach to his sources. He would take whatever he could use from other works of art and make it his by reconfiguring it in the context of his own work. There is consequently much knowledge to be gained by seeking out his sources, but at the same time there is the danger of overreaching oneself to the point of forgetting his own, extraordinary inventiveness. Numerous cases for appropriation are easily made. An example is the borrowing from Michelangelo’s Bathers, originally part of the cartoon for the Battle of Cascina – prepared for the Palazzo Vecchio in Florence 1504-6 but never finished – for the central reclining male figure of the Bacchanal of the Andrians, painted for the Duke of Ferrara c. 1520 and now in the Prado (fig. 1). While the Cascina cartoon was dismantled in 1520, the Bathers was widely copied and distributed in the following decades, and Titian himself had borrowed from it as early as around 1517 when he designed the monumental woodcut of the Triumph of Faith (fig. 2). While none of this is documented, the similarities are simply so great and the prototypes so readily available through drawn copies at the time, that the connection can be established beyond any reasonable doubt. The same can be said for several appropriations from Raphael, such as the figure in the far right background of Titian’s so-called Aldobrandini Madonna of c. 1530, in the National Gallery in London, which is taken from Raphael’s Spasimo di Sicilia altarpiece, probably finished in 1517 and readily available at the time as a print by Agostino Veneziano (fig. 3), and the standard bearer at the right of Titian’s Saint Lawrence altarpiece, finished 1559 and now in the Church of the Gesuiti in Venice (a painting that incorporates several other demonstrable appropriations), which derives from Raphael’s Standard Bearer, also engraved by Agostino c. 1516, and earlier used by Titian in the Triumph of Faith (fig. 2). 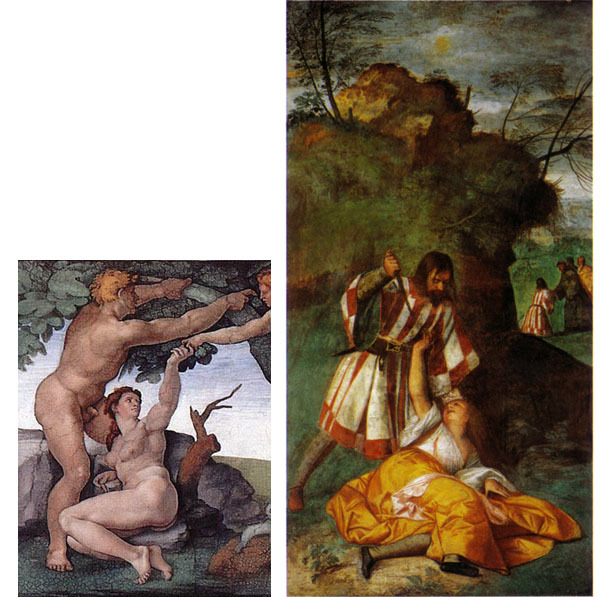 It is harder to establish a connection between the obviously similar figures of Eve in Michelangelo’s Fall of Man from the Sistine ceiling and Titian’s early fresco of the Miracle of the Jealous Husband in the Scoletta di Sant´Antonio in Padua (fig. 4). The latter is unquestionably from 1511, while the finished Sistine ceiling was only revealed in October 1512. There is some indication, however, that the section containing the Fall may have been revealed as early as 1510, and in any case one can speculate that Titian had connections in Rome – such as the printmaker Marcantonio Raimondi, with whom he had been acquainted in Venice a few years earlier – who may have had access to the chapel and could have sent him a drawing of the composition. All of this is pure conjecture however, and in no way proof that Titian himself did not come up with the daringly foreshortened prostrate figure seen in the Jealous Husband. Nevertheless, when one examines the three rather archaically composed frescoes Titian did for the Scoletta, none of the other figures in them are conceived with similar complexity, and neither are any other figures in paintings attributed to him from this period. The woman stands out, making the likelihood of Michelangelo as the inspiration great. Ultimately, however, it is a question of whether one believes whether Titian would be capable of this kind of invention at this early stage in his career – perhaps not likely, but certainly not impossible either. More tenuous is the proposed connection between Titian’s Santa Caterina Tobias and the Angel of c. 1514, now in the Accademia in Venice, and Michelangelo’s Creation of Man from the Sistine ceiling (fig. 5). Even if Titian had a drawn copy of the composition, would he really need the example of Michelangelo to design the voluminous figure of the angel? Granted, the torsion of the figure is similar to that of God the Father in the famous Sistine composition, and the pointing hand looks somewhat like the one transferring the divine spark to the inert body of Adam, but is it really so unreasonable to assume that Titian could come up with such inventions on his own at this stage? 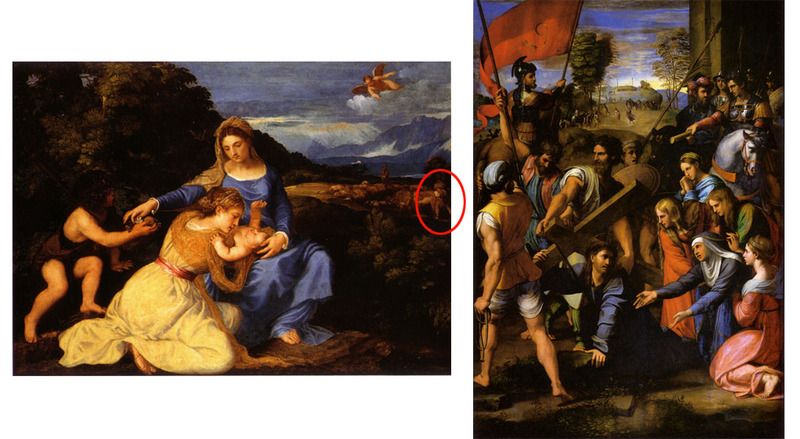 There are other, similarly puzzling examples of striking similarities between works of Titian and those of others. One is a drawing in Berlin generally assumed to be a study for the Saint Sebastian of the so-called Averoldi Polyptych, painted for the papal legate of the same name between 1519-22 (and inspired by, but not appropriated from, Michelangelo’s Rebellious Slave of c. 1514-16, now in the Louvre). The drawing bears all the characteristics of a preparative sketch for the figure and seems very close to the pen and ink study for it in Frankfurt, which is again similar, especially in the hatching on the legs, to the Uffizi sheet which is surely a study for the 1536-38 Portrait of Francesco Maria delle Rovere, also in the Uffizi (fig. 6). Now, there is some disagreement on the authenticity of all of these drawings, making it hard to identify the author by association in this way unreliable. However, the fact that they resemble each other, and all relatively unproblematically fit the profile of preparatory studies for known paintings by Titian, makes the attribution to him reasonable. 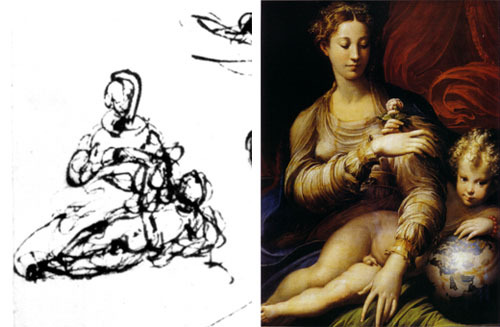 The Berlin sheet however presents a special problem in that it incorporates a small sketch of a Madonna and Child, which in conception is very close to that of Parmagianino’s famous so-called Madonna della Rosa, finished and delivered to the Holy Roman Emperor Charles V while he was in Bologna in 1530 (fig. 7). 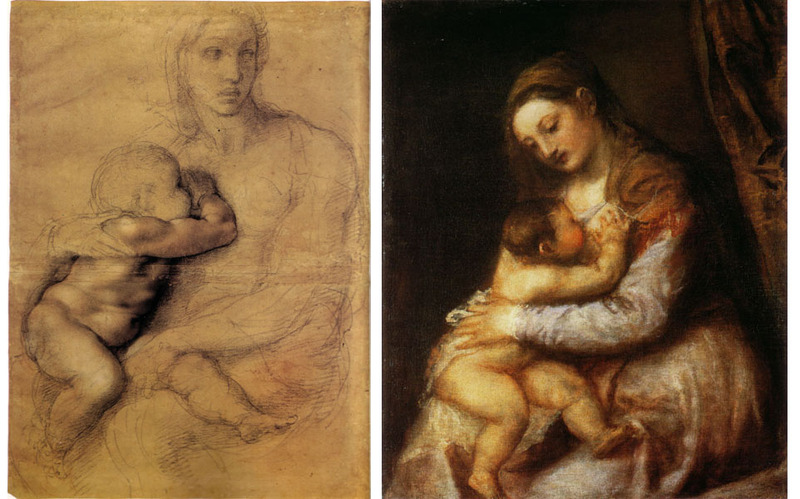 This has led some scholars to dismiss Titian as the author of the drawing, suggesting it is some kind of copy made after lost drawings or even the two paintings in question. The drawing however does not bear the normal characteristics of a copy – the sketches of the saint are loose and searching, the marks of a thinking artist working out his ideas rather than one following the lines of another drawing, never mind a finished painting such as the Averoldi Polyptych. Add to this the fact that the globe in Parmigianino’s composition is not present in the drawing as it most likely would have been had it been a copy. But if it is not a copy, why does it incorporate this design, ostensibly invented by the great Parmesan a decade after Titian painted his Saint Sebastian? 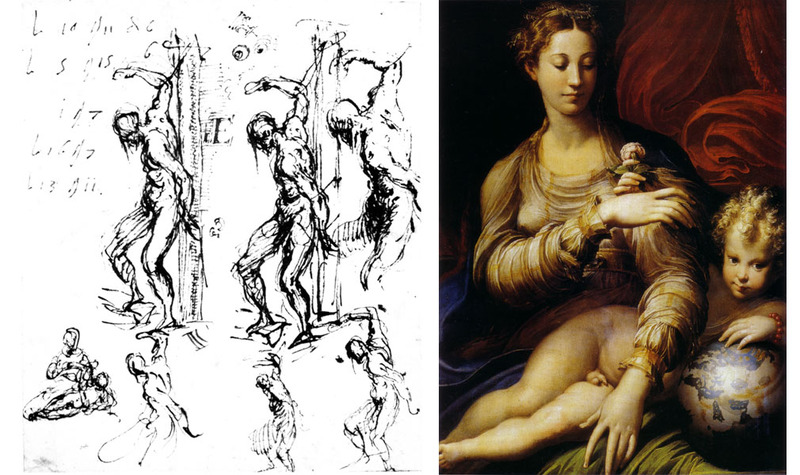 One possibility is that Titian, who visited the Emperor in Bologna in 1532-33, saw Parmigianino’s Madonna there and added a sketch of it to the sheet he had years earlier used for the sketches of Saint Sebastian. While it is not entirely inconceivable that he would thus keep around a ten-year old sheet of sketches and bring it to Bologna for noting down impressions in this way, it does seem highly unlikely. And also, the Madonna in the Berlin sheet appears to be in the same ink and seems quite obviously to have been drawn at the same time as the other studies. But is it so inconceivable that Titian could have come up with this design on his own around 1520, when he was at the height of his inventiveness and had already worked with the Madonna and Child-configuration extensively? Who knows, maybe he even took the design further in some now lost, undocumented composition that Parmigianino then derived his design from. (It should also be noted here that the written notes on the Berlin sheet, seemingly recording a payment of some sort, are demonstrably not in Titian’s hand, but since they are in a different ink they were likely added by someone else at a later date). One more example: in the National Gallery of London there is a Madonna and Child normally attributed to Titian in his late phase between 1570-76, and if not entirely by him then assisted by someone in his studio (I believe it is entirely autograph, but whether it is or not matters little here). The posture of the Child bears a striking resemblance to a drawing of a Madonna and Child by Michelangelo in the Casa Buonarotti in Florence, dated to the mid 1520s, leading scholars to assume that Titian yet again derived a design from his central Italian rival and life-long artistic sparring partner (fig. 8 ). To justify this, attempts have been made to argue for the presence of a drawing similar to it in the Grimani Collection in Venice in the 1570s, which Titian could have seen, but this remains pure speculation. Would it not be more natural to assume that he, a life-long observer of children, working on a motif as familiar to him as this, would have come up with this very true-to-life posture of a suckling child independently of Michelangelo? We of course cannot know for sure, but it seems to me that art historians have too long been expected to establish connections and produce rational, coherent arguments that the notion of coincidence, and of parallel invention by immensely imaginative artists, has been neglected and is too soon discounted. It seems that overly complex rationalisations for the establishment of connections between works are preferred to the idea that there is no direct link, but they merely look similar. Art is not always logical and predictable, creativity even less so. Fig. 1: Bastiano (Aristotile) da Sangallo after Michelangelo, Bathers (section of the Battle of Cascina), 1542, oil on panel, 76.4 x 130.2 cm., Holkham Hall, Norfolk & Titian, Bacchanal of the Andrians, c. 1519-20, oil on canvas, 175 x 193 cm. Madrid, Prado; Fig. 2: Agostino Veneziano after Raphael, Standard Bearer, c. 1516, engraving, 25 x 18 cm., unidentified cutters after Titian, details of The Triumph of Faith, first edition, 1517, woodcut on five blocks, 39 x 264.2 cm. & Bastiano (Aristotile) da Sangallo after Michelangelo, detail of the Bathers; Fig. 3: Titian, Madonna and Child with Saint John and Saint Catherine of Alexandria, c. 1530, oil on canvas, 100.6 x 142.2 cm., London, National Gallery & Raphael, The Road to Calvary (‘Lo Spasimo di Sicilia’), c. 1516, oil on canvas (transferred from panel), 318 x 229 cm., Madrid, Prado; Fig. 4: Michelangelo, The Fall of Man, c. 1510, fresco, Rome, Vatican City, Sistine Chapel & Titian, The Miracle of the Jealous Husband, 1511, fresco, 340 x 185 cm., Padua, Scoletta di Sant´Antonio; Fig. 5: Titian, Tobias and the Angel, c. 1514, oil on panel, 170 x 146 cm., Venice, Accademia & Michelangelo, The Creation of Man, c. 1511, fresco, Rome, Vatican City, Sistine Chapel; Fig. 6: Titian, Studies of Saint Sebastian and a Virgin and Child, c. 1519, pen and brown ink on white laid paper, 162 x 136 mm., Berlin, Kupferstichkabinett, Study of St. Sebastian (recto), Various Studies: Head in Profile, Three Feet and Part of Leg (verso, not shown), c. 1519, pen, brush and dark brown ink on blue paper, 18 x 11.5 cm., Frankfurt-am-Main, Städelsches Kunstinstitut & Study for Portrait of Francesco Maria della Rovere, c. 1535, pen and brown ink on thick cream-coloured paper, squared, 237 x 141 mm., Florence, Uffizi; Fig. 7: Titian, Studies of Saint Sebastian and a Virgin and Child (see above) & Parmigianino, Madonna and Child (‘La Madonna della Rosa’), 1528-30, oil on panel, 109 x 85 cm., Dresden, Gemäldegalerie; Fig. 8: Michelangelo, Madonna and Child, c. 1520-25, black and red chalk on prepared paper, 541 x 396 mm., Florence, Casa Buonarotti & Titian, Madonna and Child, c. 1570-76, oil on canvas, 75.6 x 63.2 cm., London, National Gallery.